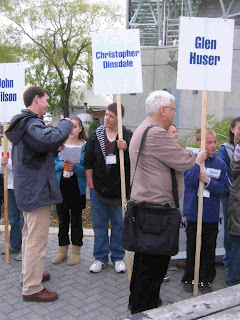 Christopher Dinsdale was honoured to participate in the 2008 Red Maple Awards at Harbourfront. The event was both exciting and well-organized. Christopher and nine other selected authors started the day off by speaking to the thousands of students who attended the event before the winner was selected. Congratulations to Eric Walters for winning the 2008 Red Maple Award! After the ceremony, the authors signed autographs and participated in the many story-based activites organized by the Ontario Library Association. It was a chilly but fun day for all! to read from their latest books and to discuss the writing process. I was lucky enough to be asked to take part in the Blue Metropolis Literary Festival's first ever Children's Festival this year. The kids from the grade 2 class from Westmount Park school came to my reading at Westmount library. They watched the pictures on screen as I read my book The Fragrant Garden. After a lively Q&A, and a short documentary on how a restaurant works, they set about creating a menu for their own restaurant. It was a fun morning! 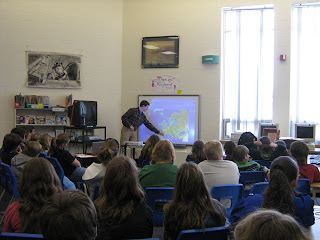 Christopher Dinsdale was honoured to be part of the Kawartha Pine Ridge School Board Forest of Reading celebration. 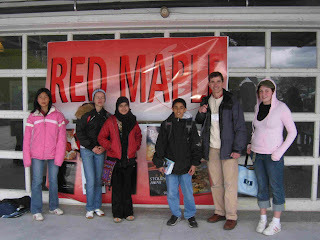 Red Maple participants from across the region converged on Bowmanville for fun activities, pizza and a visit with a Red Maple author. Christopher enjoyed leading the presentation entitled "Developing a Storyline through Research". The students and teachers wished Christopher all the best as he heads off to Harbourfront next week for the Red Maple awards. Brenda Chapman as Chair of Capital Crime Writers is being introduced by RJ Harlick at Crime Writers of Canada's Arthur Ellis shortlist evening on April 30th at the Ottawa Public Library. 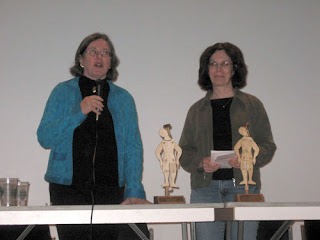 The Audrey Jessup short story contest shortlist was also announced during the evening, and Brenda's entry "Evening the Score" made the final five.